Premier Dr D Orlando Smith in the House of Assembly on Thursday. Expatriates will not be asked to leave the territory if they have been offered jobs contributing to hurricane relief. 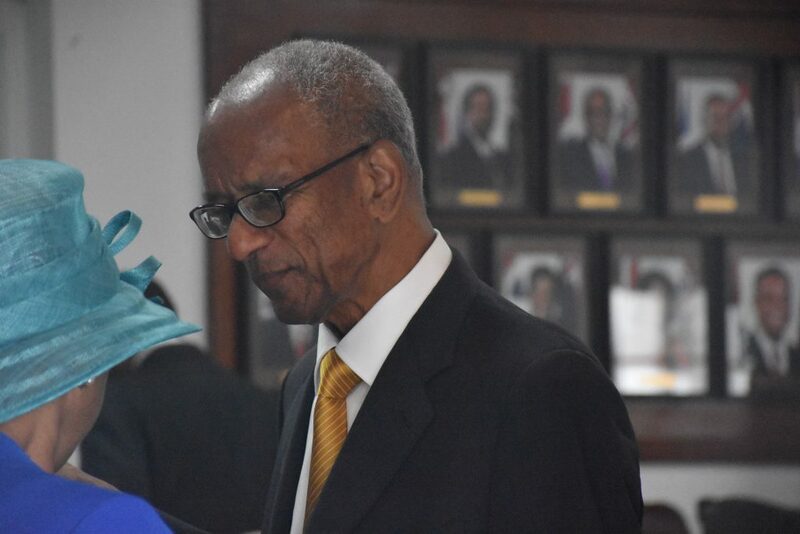 Premier Dr D Orlando Smith made that statement while answering questions in the House of Assembly on Thursday, March 1. “Those who are here will continue to work once they have been offered employment. Those who are coming in will also be offered work,” Dr Smith said. The Premier’s statement contradicts a policy the government implemented three months ago, which mandates that persons who can find jobs depart the territory if they have been living in the territory for less than three years. According to the said policy, only persons living or working in the BVI for five years or more will be allowed to stay. There have been post-hurricane reports of persons being told to vacate the territory while changing jobs. Meanwhile others are being laid off…or am I missing something? BVI has a massive problem with depopulation right now, you are also in a chronic recession. We need to put our differences aside and work together, there is no time to lose. We need as many people as we can get, expat and belonger who can work hard to rebuild this country before its too late. Tourists are here now but if this place is still a mess next year I guarantee you they won’t be coming back! Action Now! Really want the least desirable of the population to leave so BVI could get a new start with better. Cant say I blame him. BVI has been good yo me and I am happy and grateful but a lot of people mash it up. Expat you sound very evil.Since you have other options, why are you still here? The God Lord will deal with people like you who would want destruction on the same place where you reside. Pray that when destruction hit you will be alive to tell the tale. Mr Premier do you know what you are doing? Often you only respond with potential solutions when you are put on the spot by clued up members of the public!!!! You should be leading, resolving issues, pro active instead of this continual fire fighting – I think u are a nice man but believe you are way out of your depth and need to hand over responsibilities to much more capable people, please do so soon this is embarrassing to witness continually every week…It was your government that has resided over this expat fiasco and I know of many that would have returned but won’t consider it now and you have only yourself to blame…. People not returning is a welcome relief. Premier Dr D Orlando Smith, I salute you sir!!!!!!!!!! At least admit you got it wrong…Most governments do U Turns when they realise the policy is flawed which this one certainly is but be man enough to admit it – We’d respect you more, but I fear the damage has already been done beyond repair…. All these government agencies do is give the Premier something to read and he does just that. Immigration, Tourist Board, Labour, same crap. And the saga continues. Does this man need help? What he’s saying and what is happening are two different things. Does this man tells no truth? Why so many people always think that because one is quite they are nice? Those types of people are the most deadly. The hill man suggested this but was ignored. The businesses struggling to get back open are going to find that their key workers have been shipped out when they do. If the business writes to say that once it opens the person will have their job back then the workers should be allowed to stay. If not the next problem will be that there are no skilled workers to get the economy moving again. “Those who are coming would be offered jobs”? What about the people who are already here? Has he checked that it really does not have enough people to perform the work in the territory. Some people staying and living off others. Some of them are not paying rent and are not afraid to say that they are not working. So why am I expected to let people stay in my place without paying rent until they find a job. What if they have no money to sustain themselves then what? Will the business commit to paying their bills as well? Probably not if it’s a small business struggling to reopen so there is a catch 22 there. You can’t argue with Government trying to ensure that people living here can afford to take care of themselves. Civilised countries have social security systems that pay people when they are temporarily unemployed. BVI collects a fortune in social security money from workers, the majority of whom are ex pats, and their employers. But it pays out nothing and instead buys tracts of land to help out the ruling families and invests in banks while the people who gave it the money are destitute. Another example of the heartless cruel and out of date treatment of people in BVI. Please be kind and list the countries that pays out to the unemployed moneys from their ss funds for temp unemployment. I will be so grateful because I will be leaving the BVI and looking for greener pastures. Looking forwarrd to your response.Thanks. I cannot return to my country for the wages are really low and no benefits daily murders robberies and burglaries all the time. Too many cooks in the kitchen right now belly aching and excercising their uncontrollable and inherrent urge to colonise. If this urge could be curbed the world would be a better place. History does not lie. Ok. But gotta be careful with the permits and jobs of convenience. Premier seems to be easily taken in. Yes yes,that would be perfect because BVI need to clean out and clear out the make up of the imported population. Start with a cleaner slate. When they go, open the door and let in those more desirable for a better BVI. Bring in those who do not have a reputation and proclivity for crime. There are some easy wins here. Some people have been here ten, twenty, thirty years, contributing, no doing wrong and have no status at all. We can lose the loyal and the known or we can offer them permanent residency (10yrs) and citizenship (15 years) or at least in the categories we want and depend on most and at a significant revenue fee to government. They are all going to be tempted/ forced to by property ( stamp duty revenue and investment in local construction people, for that we need a resident nonbelonger rate at 5per cent). We can also offer 2-3 year permits that match many people’s contracts and get more money in sooner. All of this demolishes the build up in labour and immigration workload so they can focus on the more risky or more transient employment. This helps stem depopulation which will push the economic problems further. Yes, there will be opposition to this but none of it coherent or with positive alternative solutions. The alternative is inexorable decline and to the benefit of our regional and international competitors-which is where future BVI folk will have to move (as expats) to get on. Those to whom you refer as ” loyal ” are, in my opinion, in the same boat of undesirables. Their silence on this troubling issue makes them silent partners and coconspirators. Their silence gives an affirmative nod to the systematic destruction of these islands by their fellow countrymen. and countrymen within the VI. The are in fact, coconspirators and deserve little or no preference for their requests to remain in the VI as long as they wish. So now they realise they don’t have the work force they want people to stay. Anybody else feeling like a raped proustite? Or is it just me?